Recent postings to The Conversation have enlivened the debate over the “Great Transition” that is underway all around the world from the fossil-fuelled energy systems of the 20th century to the renewably powered systems of the 21st century. The future for solar is particularly bright, according to authors including Mark Diesendorf, Andrew Blakers, James McGregor, and most recently Lynette Molyneaux. Many of the postings point to a brilliant solar or wind or geothermal future – but then fall back on an argument for subsidies to make up for the higher costs of the renewables. It can now be stated definitively that such arguments are out of date. Renewables in many cases are actually cheaper than their fossil-fuelled rivals. And the most important such case is that of solar photovoltaic cells – the cells that convert sunlight directly into electric power. The Bloomberg New Energy Finance team in London have recently produced a White Paper on “Re-considering the economics of photovoltaic power” (available here) where they make some very important points. Consider the chart showing falling costs for solar PV over the past 35 years. 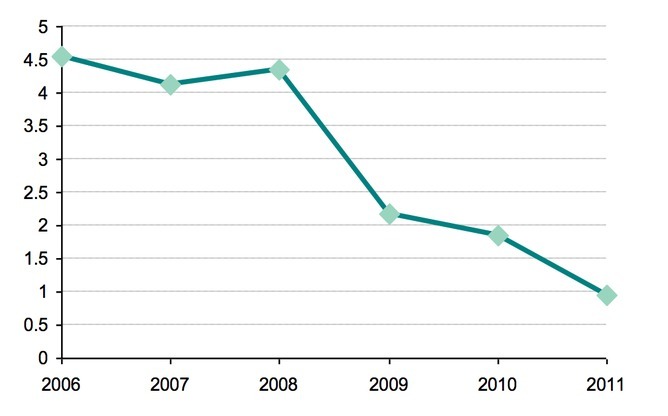 In this chart, the overall experience curve is shown in the upper blue line, indicating that costs had reduced to the long anticipated point of $1 per watt by the end of 2011. 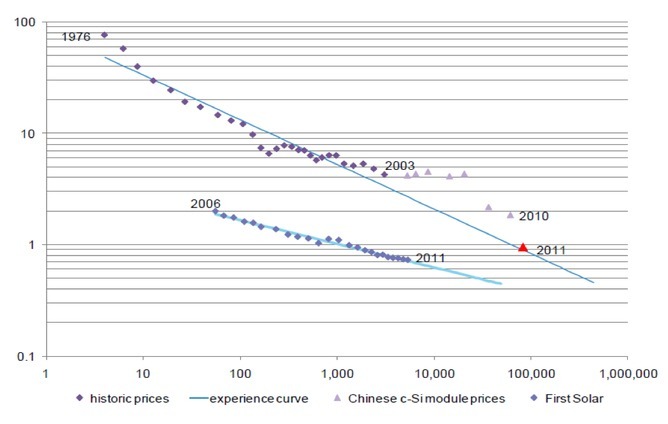 But the years immediately preceding this show that costs hovered for several years (2004 to 2008) at around four times this level ($4/W) – a phenomenon now understood to be due to the fact that suppliers were able to purchase modules at that price because feed-in tariffs were the dominant influence rather than cost of silicon. But as silicon shortages were overcome price competition reasserted itself. As silicon supplies grew, so manufacturers reduced their prices, which in turn reduced input costs for solar cell producers, and their prices fell as well. The bottom blue line represents the cost curve for thin-film solar cell producers, dominated by the US firm First Solar. Because TF PV cells utilize much lower quantities of silicon their costs have always been lower – but are not yet enjoying the economies of scale of amorphous silicon cells. The message for countries looking to develop solar energy systems is clear: the costs of solar PV cells are falling by around 45% per year. In many developing countries with above-average insolation (a measure of solar radiation received) – which means countries right across the tropical belt – this means that producing electric power from solar PVs should now be cheaper than producing power from stand-alone diesel generators, for example. The reason that such countries would go on utilizing the dirty, unreliable diesel generators, which offer no developmental momentum of their own (in terms of building new industries for the EDCs) must be inertia – and ignorance. The China factor is vividly illustrated in the case of solar PV cells. 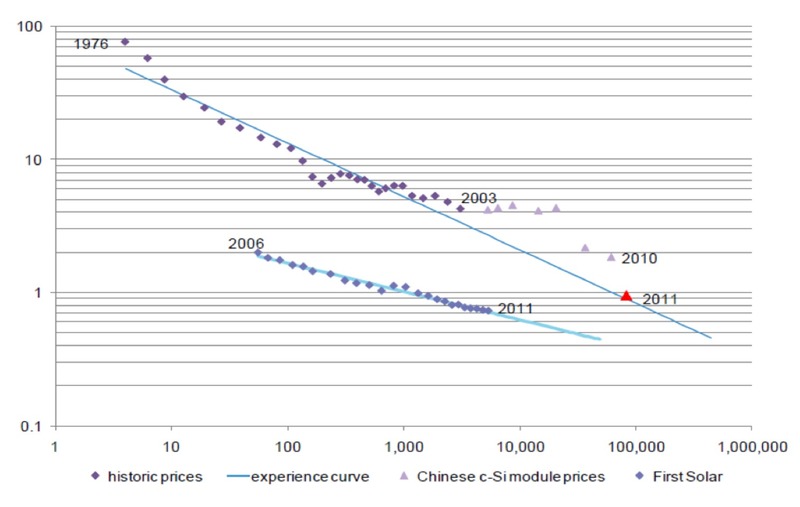 Chinese PV cell producers have reduced costs by 4.5 times in just the last five years – as shown in Figure. 2. This chart reveals that the real force driving down solar PV costs is the expansion of manufacturing in China. No other country can match such cost reductions – which, it must be pointed out, are real cost reductions, and not artifacts of trade policy. This is why the US decision to impose punitive tariffs on Chinese solar PV systems imported into the US is problematic. For most countries, these cost reductions mean that building power systems that utilize solar input received within the country (rather than fossil fuel imports with all their energy insecurity implications) is an optimal development strategy, based on reliable and cost-effective power. It also demonstrates that developing countries need to benchmark Chinese manufacturers if they wish to enter the field of solar PV cell production for themselves. Intelligent policy is called for, on both the supply and demand sides. On the supply side, solar PV subsidies should be declining, because the industry can increasingly compete on costs – but it does need to compete on a level-playing field, and that means eliminating now, and once and for all, the hidden subsidies still paid to the fossil fuel merchants (including the super subsidies paid to aluminium producers who use so much thermal power). And on the demand side, it needs intelligent phasing in of competitive tariffs through a national feed-in tariff scheme that should be able to be eliminated after five years – once it has done its job. Consider a third chart from BNEF, showing how German feed-in tariffs are being drastically scaled back, because they have achieved their effect – just as the costs of mobile phone calls have been dramatically reducing and now approximate those of land lines. The industrial dynamics of technology transitions are all about falling costs – that is the message. 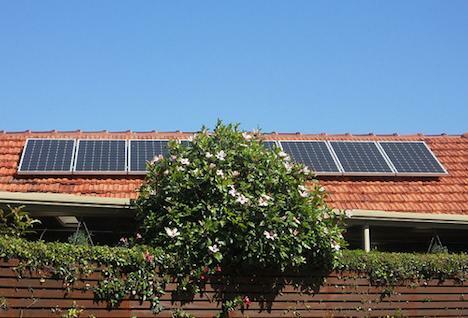 In Australia there is still no national feed-in tariff scheme, which would do far more to promote solar PV installations than the Solar Flagships program. The winner of the PV aspect of the Solar Flagships was announced very recently (awarded to AGL in conjunction with First Solar) – but with generating costs estimated at $2.80 per watt (see Tristan Edis at Climate Spectator) it is still well above the world best costs as revealed by the BNEF white paper. The question that MPs should be posing to the federal government is why Australian PV projects’ costings are so far out of line with world best practice, and why the federal government has still not taken any initiative to instal a national feed-in tariff scheme which would be expected to have the same effect as in Germany, and could be eliminated within a few years after it has done its job. John Mathews does not work for, consult to, own shares in or receive funding from any company or organisation that would benefit from this article, and has no relevant affiliations. Look forward to seeing you there with any thoughts you have on topic (though short off topic is welcome, just keep it in the bounds of good taste).